The Island of Phelps: Summer! We've been taking things pretty easy so far this summer. I took my final the same day Gareth finished school (did I mention my final was comprehensive for the whole year of Chem, not just the quarter? Yeah, that was fun) and then had my final concert of the season that weekend. Naturally, I was ready for a break after the concert was over. So this last week I didn't attempt to clean the house or take the kids anywhere. We pretty much sat around, watched the World Cup, and played video games. We did manage to get Gareth signed up for the summer reading program. And we got a bike trailer to borrow long-term from a friend. I decided that this week we should attempt to get a little more in, activity-wise. So we started the week off with a bike ride to the Locks. Gareth was excited that we saw a seal; I even caught a glimpse of it as it chased a salmon. This is the time of year to check out the fish ladder - tons of salmon right now. Our friends, the Redpaths, joined us and we all enjoyed a picnic lunch on the hill and throwing a frisbee around a bit. Yesterday we had a couple other friends over while their mom had a meeting. 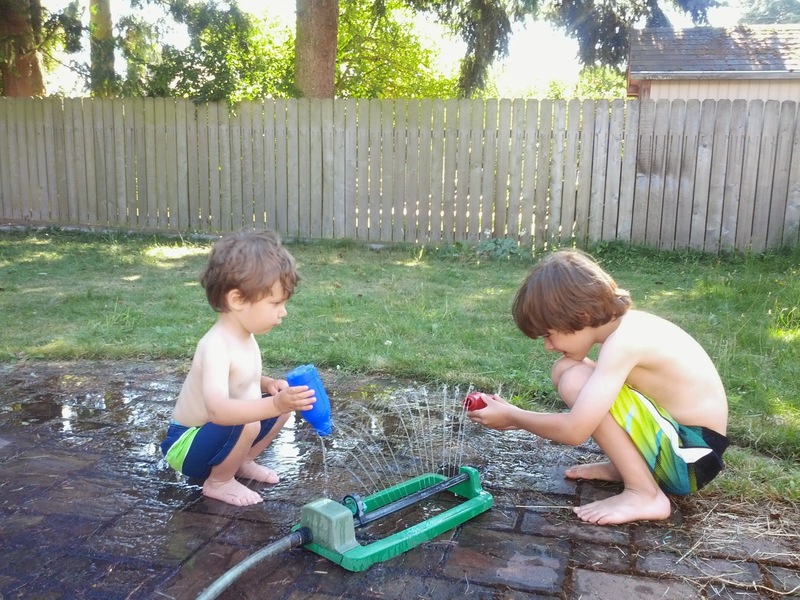 It was in the 80s, so the boys all hung out outside in their swimsuits, playing in the sprinkler and with water guns. 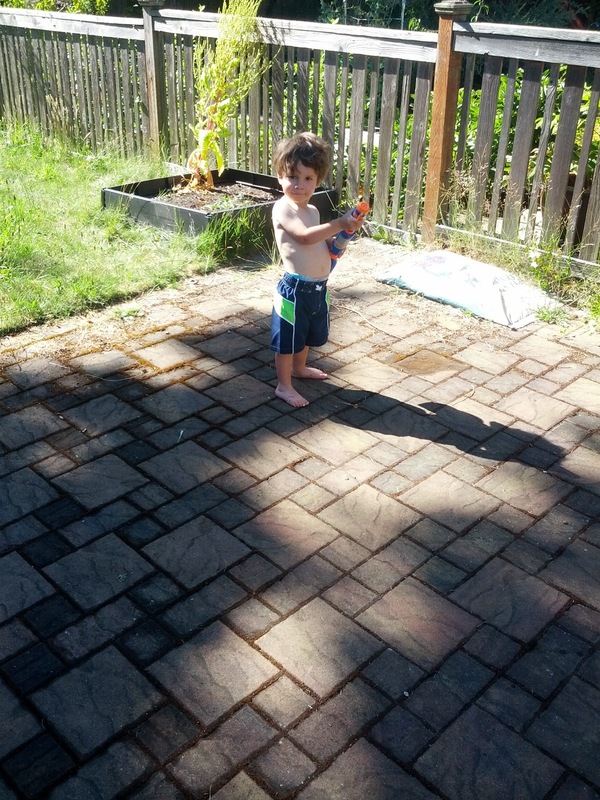 Malcolm was excited to see the water gun work with water in it (they play with them often without water). At one point he accidentally almost hit me with the water. Then he "accidentally" almost hit me again. After that he gave up any pretense of it being an accident and giggled gleefully while trying to hit me. Good thing I can easily get out of the way and his water supply didn't last too long! 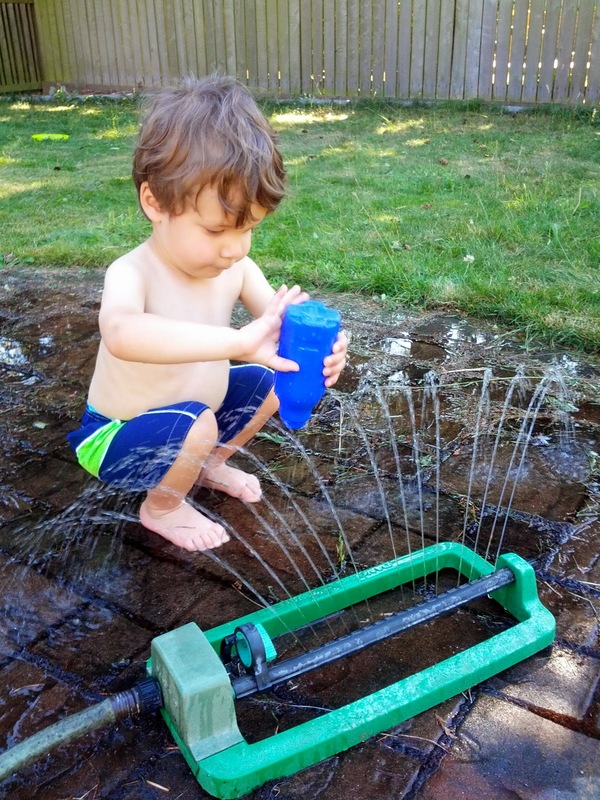 The sprinkler had to be set low or he'd be terrified. 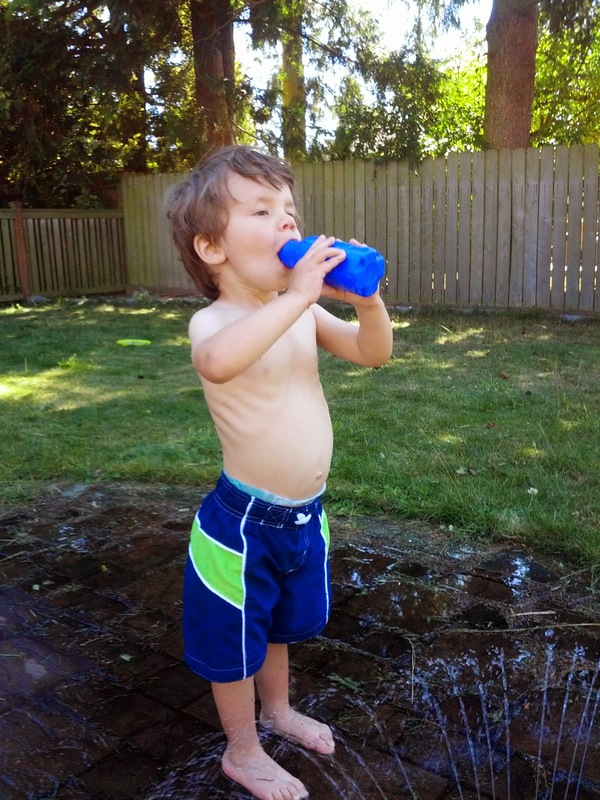 Apparently filling and dumping the bottle from the water gun was really fun. Gareth decided it was fun as well. Hopefully there wasn't too much dirt, mold, etc. in there! Today our friends reciprocated and had our boys over while I went downtown to meet up with Ryan for lunch. He's been wanting to show me his office and have me meet some of his coworkers that he always talks about. So we did some introductions and he showed me around their part of the building and then we headed out to lunch with one of his coworkers. The boys had a great time hanging out with their friends again. Up next for the week - cherry pitting with the Redpaths tomorrow afternoon, Brazil game and meeting the new baby on the street on the fourth, then my birthday, then possibly going raspberry picking with Ryan's coworker on Sunday. Your upcoming activities sound like a lot of fun. Congrats on finishing your year of school and concerts. Busy!